At times gardening in KS can feel sort of like prayer, especially given the drought, heat and wind. One hopes that the effort put forth will bring about SOME results, and not just sweat, blood and tears. From what I have heard there is no questioning the results of the Rainbow garden. Thanks to the hard work of church members and volunteers (see slideshow below), each year the Rainbow Garden provides hundreds of pounds of fresh tomatoes, potatoes, onions, broccoli, cabbage, beets, sturdy greens and other vegetables for Freedom School culinary staff, who provide a nutritious breakfast, lunch and snack to more than 100 students every day. See the picture to the right? 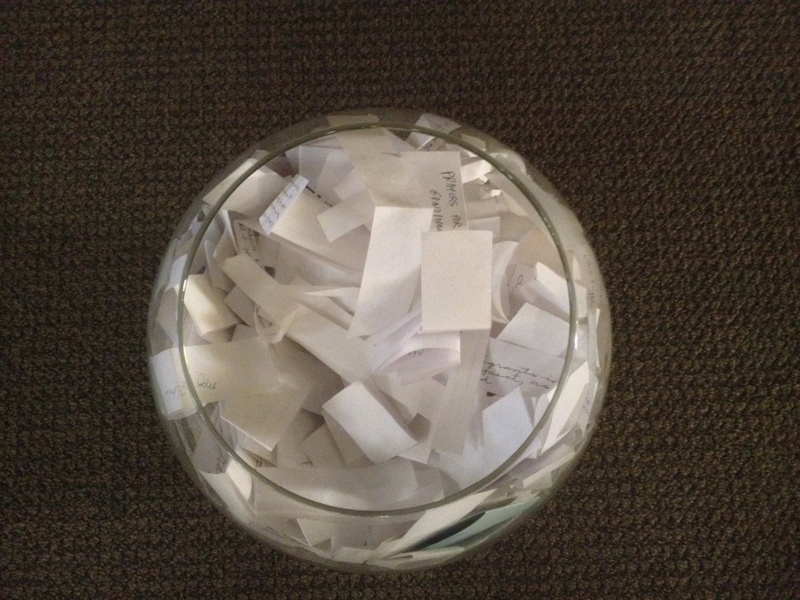 That is our prayer bowl that sits at the front of the sanctuary. On Easter morn we will have a ritual in worship whereby we affirm and release these prayers into God’s keeping and into the good earth. After pouring water on them, they will be tilled into our Rainbow garden, symbolic of the fruit and life that we hope grows from our praying. Our hope is to have a similar ritual every year around Easter, so keep praying! Note that these prayers have been offered anonymously and have not been read by anyone at Rainbow. If you have a prayer request that you would like a pastor or deacon to be aware of, please find some way, even if anonymously, to make that request. And speaking of Rainbow Deacons, this Thursday during our monthly meeting we will take turns holding this prayer bowl, saying our own prayers over the prayers. Prayers on prayers on prayers on prayers will surely make for a beautiful Rainbow garden/church!